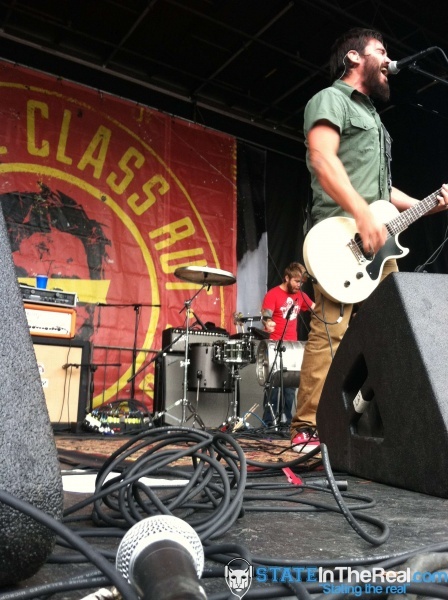 Tons of rockers headed to Scranton, Pa last weekend for the 4th annual Rockstar Energy Drink Uproar Festival. 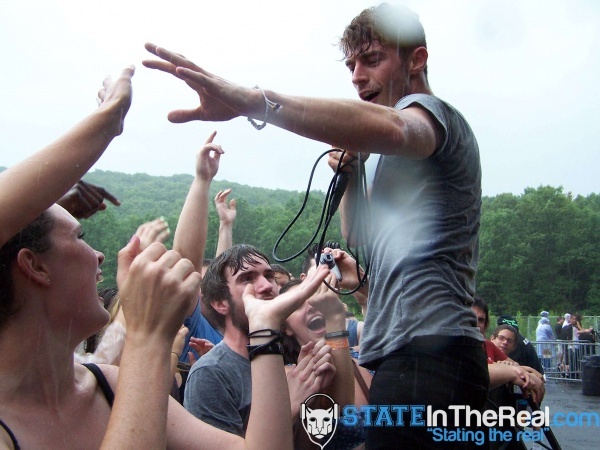 Clothes may have been dampened, but spirits weren’t, as fest-goers enjoyed the band New Politics (shown above) despite sporadic rain showers throughout the day on Montage Mountain’s Toyota Pavilion. 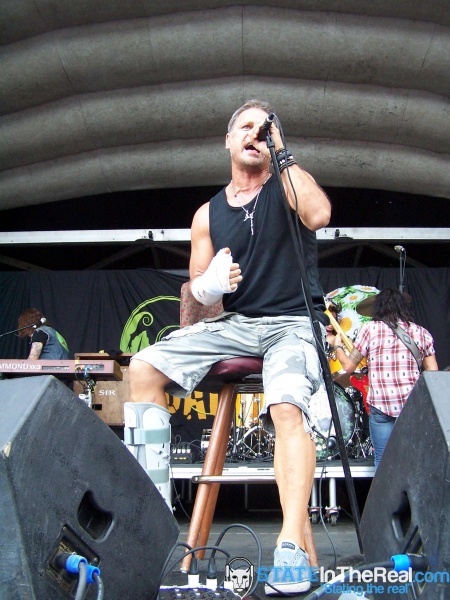 Along with the Denmark native band, seven bands performed on two alternating stages during the afternoon, including other slightly out of town bands such as the Charming Liars hailing from the UK, and The Dead Daisies from Australia, whose lead singer, Jon Stevens, still jammed with his band on stage while sitting on a stool because of injuries he apparently got while on a fishing trip before the tour. Other afternoon performances included Beware of Darkness, which were awful. The lead singer’s voice was so terribly high-pitched and cracked that people actually drifted away from that stage to the other empty stage, because it was preferable for many to watch stage crews, leave and get beer, or a perfect time to check out the port-a-potties. Regardless, other bands like The Chuck Shaffer Picture Show, Middle Class Rut and Walking Papers roused the crowd and put on a great show. Speaking of the main-stage, at 6 pm crowds headed over for Circa Survive, which kicked off their set ironically with “Oh, Hello” and ended with “Get Out.” Despite frontman Anthony Green’s subtle message, rockers stayed, and continued to fill the amphitheater for the progressive metal band Coheed and Cambria. What I know for sure is headliner and power-house grunge band Alice in Chains had no issues when it came to sound. 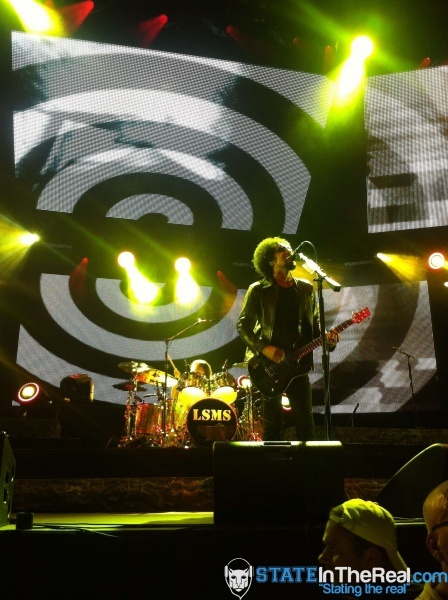 Singer William DuVall continues to impress with his ability to bring old AiC songs to life with his voice that sounds so eerily similar to the late Layne Staley. The unique harmonic vocal style between DuVall and guitarist, Jerry Cantrell, keeps Alice alive, as the band released their second studio album with DuVall this past May titled The Devil Put Dinosaurs Here. However, AiC didn’t play any songs on their new album besides “Stone” and “Hollow” which they played at shows earlier in the year before the album’s release. 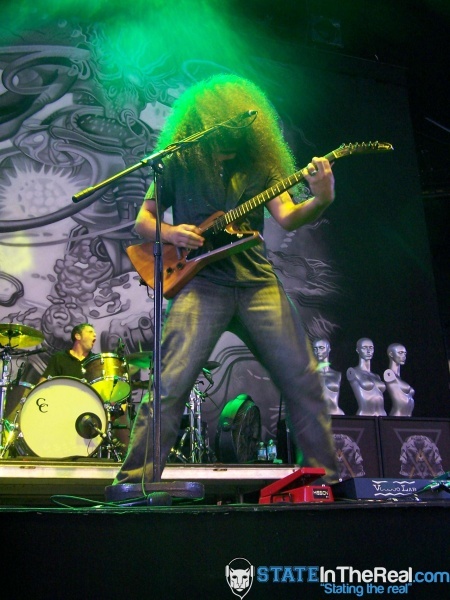 Although, proving their progressiveness, they did open with one of their newer songs, “Check My Brain,” from their 2009 album Black Gives Way to Blue. They also played “Acid Bubble” from that album, which was a little surprising and pretty mesmerizing in coordination with the bright bubbly animation illuminating on the screens behind the band. Alice played their classic hits like “Them Bones,” “Man In The Box,” “Would?” and punched out the end of their 13 song set with “Rooster.” The band then showered the front section of the crowd with picks, drumsticks and I think a sweatband. Needless to say, AiC put on a phenomenal performance at Uproar, which all in all had a great line-up of artists, all playing to benefit an incredible cause.